A Right or A Duty? A Privilege? Imagine. If you had a relationship with a something that was absolutely ancient, and so precious that life—including yours—couldn’t survive without it, what would you do to care for and protect it? If it needed food and water and air, would you ensure that it had plenty and the best possible? If it were vulnerable to the ravages of weather—the wind, sun, and rain—would you make certain that it was shielded from harm? This soil is ancient. The mineral parent rock once sat naked. Time and water, sun and cold broke the rock into stones, the stones into dust. For a very long time the earth sat aging, then the life process started, and living soil was created. Thousands of years of plants have left their condensed energy and captured time stored in the organic matter. Farming it in present time is a relationship with the past. Imagine the soil has a heart and we’re walking all over it and talking about it. What is this like for the soil? It doesn’t get a say. People walk on it, talking, making human plans, like it is ours to open up and do as we want. Think how long this has been going on here. Since they broke the prairie off of this land, one hundred forty years of doing this to soil. What was it like for Ole Olsen the first time to pick up handfuls of virgin prairie loam? What did it smell like? What happiness did he feel? If we knew what we know now, what would we do different? If soil was virgin, what is farming? Do we choose a love affair, or is it a coarse taking? 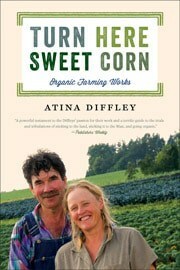 — Excerpt Turn Here Sweet Corn: Organic Farming Works [Read more…] about A Right or A Duty? A Privilege?